Why Portable Boat Shelters & Garages? Unless you have thousands of dollars to spend on an expensive dock harbor for your boat consider using an industrial strength portable garage shelter to provide maximum protection and security for your vessel. We carry a wide selection of sizes and colors to custom fit your boat. Boat storage buildings and garages are weather-resistant and also protect paint and metal from harmful UV rays. We carry both house and barn style shelters for all-purpose protection. These commercial grade storage shelters have ample room for boats, boat trailers, boat accessories like sails and motors and even dinghy’s and row boats. Securing a spot at a local harbor can be incredibly expensive. Not only do you have to be a member of the yacht club, which in itself can cost a couple of thousand dollars a year in dues, but your boat is under their protection and you may not always have access to the slips. Leave all that behind when you buy your own sturdy portable shelter and take matters into your hand where you know your boat will be safe. Portable Garage Depot offers the best in custom boat buildings and portable boat storage building kits for bass boats, pontoon boats, yachts, trailers, equipment material storage and workshop areas. Our portable all weather boathouse frames are built to last, using powder coated steel framing or galvanized steel tubing to ensure the best in all weather protection. All fabric components feature heat welded seam construction to maintain 100% waterproofing. Covering your boat, supplies or trailer with a UV resistant, fire retardant, polyethylene with fabric backing and rip stop material. Protecting your boats and materials from all weather conditions. Why go through the hassles of dry docking fees, shrinkwrapping, yearly maintenance and waiting lists when you can purchase an affordable, easy to assemble, portable boat storage building kit from Portable Garage Depot. All of our easy to assemble kits come with easy to read instructions, easy bolt together design, and are pre drilled and cut to your specification. The predrilled frame makes for easy assembly with minimal hand tools. 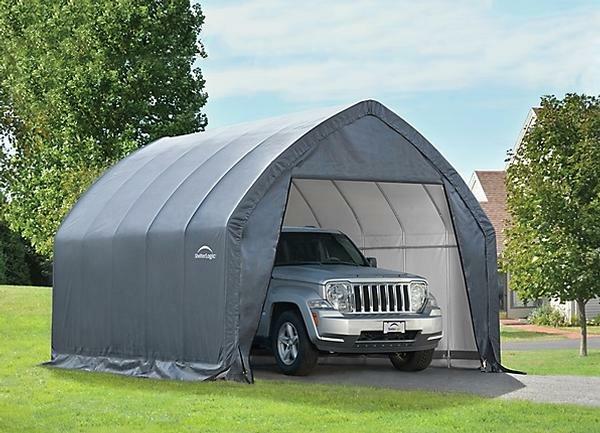 Along with sturdy construction and maximum protection from the elements, you get a heavy duty multi purpose, all weather, instant garage, or storage building, that can be used for most anything when your boat is coming out of the water for the off season. Cars, trucks, motorcycles, campers, yard equipment, materials, or even basic storage, these units can be used to store just about anything. Our line of all weather storage buildings kits include, round style buildings for great snow, sleet or rain runoff, peak, peak or house style building kits, for all of your storage needs. Our portable shelters offer an alternative to common methods of off season boat storage. Maintain and store your boat and accessories in your own personal, temporary portable boat storage building from Portable Garage Depot. We offer affordable pricing, easy assembly, heavy duty construction, maximum protection against the elements and an array of personal perks that will help make your boat stay in the best condition possible. For as long as you own your boat. Our all weather shelter kits come in a variety of colors, shapes and sizes, to help suit your needs. Different sizes for each product assure a perfect match for what you are looking to protect. We are a leading manufacturer's supplier of all instant, portable, all weather storage shelters and buildings. We guarantee to have the lowest prices when buying factory direct. Depending on which building we have powder coated steel or galvanized steel tubing to ensure maximum durability. An assortment of styles and colors, easy to read instructions, and easy to assemble construction allow for the best alternative to metal or wood construction expenses. You deserve the best in protection and we offer the best solutions to your protection needs. Our UV resistant, fire retardant, polyethylene cover with rip stop material will keep your possessions safe from the elements. 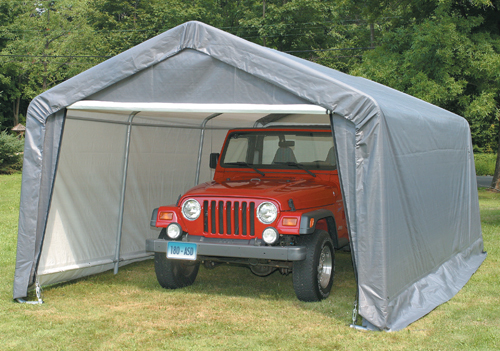 Cover it up with Portable Garage Depot's durable, portable, all weather custom boat covers and portable boat storage buildings.